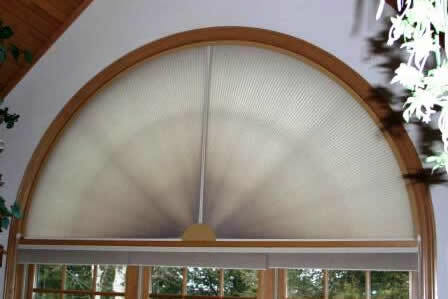 There is nothing like the Movable Arch Honeycomb Shades system offered in the window treatment market. Although arch and half circle windows have been around since before Caesar, their popularity has exploded as they are incorporated into more and more mid to high-end house designs. These three choices are at best marginal compromises. 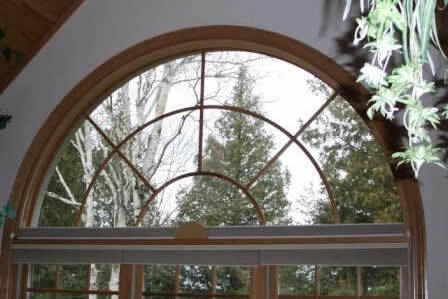 After all, these large (up to 12' diameter) arch windows are intended to be an architectural focal point of the home. Why would anyone want to "hide" them behind a fixed treatment (one that closes off the window and is never intended to be moved.....so much for the view!!) Those who have opted to go without treatments have struggled with thermal, light and privacy issues. The Movable Arch Honeycomb Shades system allows one to choose as much light, privacy or view as they want…………when they want it by adjusting either shade to: open, closed or any position in-between. Completely unobstructed view in the open position. The patent pending system utilizes a track mechanism that accommodates leading brands of pleated cellular shades. The innovative design provides for fast shade removal for window cleaning or décor change. 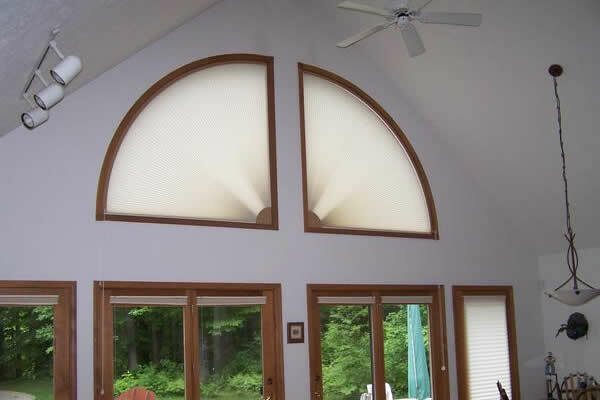 The arch window treatment system is available for both large half circle windows and large quarter circle windows. The Movable Arch Honeycomb Shades system has optional power available. 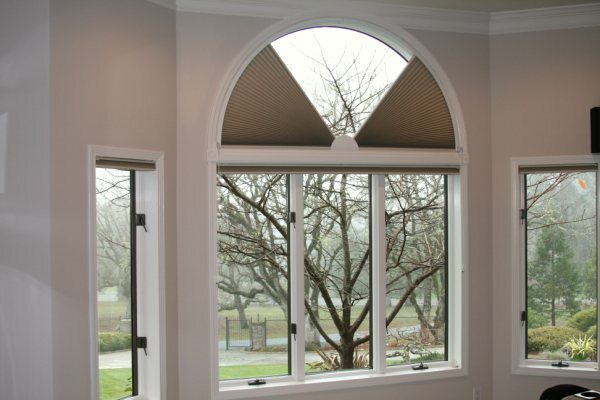 These arch shade solutions are ideal for imperfect arch windows. Perfect arches are not too common. 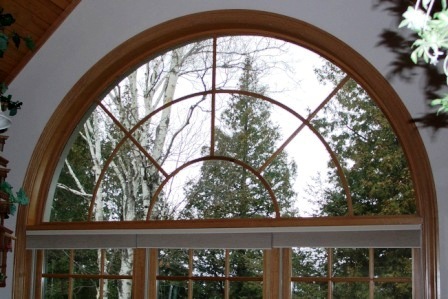 Typically, arched windows are constructed in a manner where the sill is built up into the window area. The resulting radius is less than half the diameter and no longer "perfect". 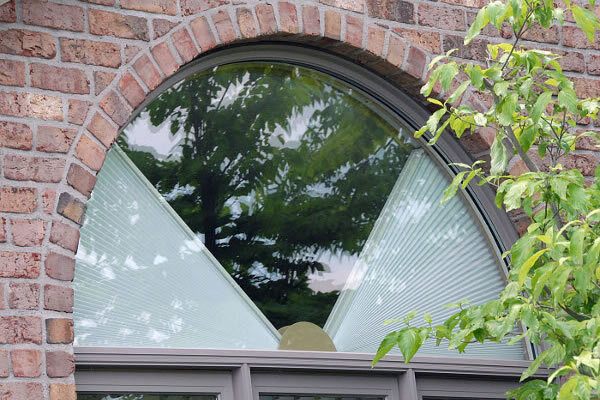 The Movable Arch Honeycomb Shades system will allow for up to 2" of short radius and up to 2" of long radius. Long radius occurs when there are "legs" on the arch. Instead of needing a radius of exactly half the diameter, the system works with a radius that can vary as much as +/- 2" from perfect!